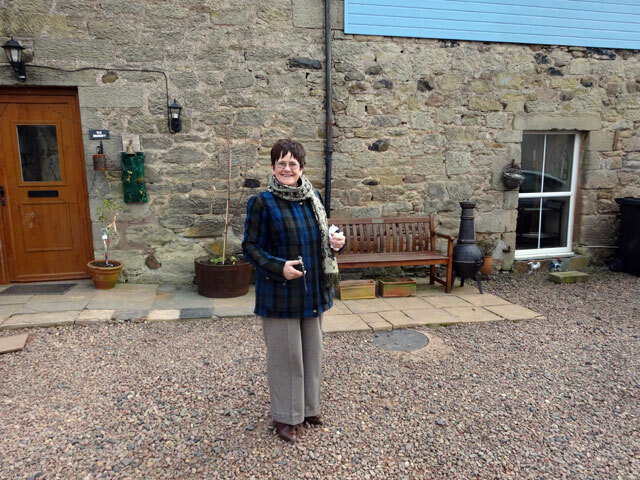 I snapped Rachel looking very happy in the new coat she got from Tweedside Tackle when we visited Kelso on Saturday afternoon. Doesn’t she look good? I woke and immediately turned on my i-pad. Instantly it was clear that the New Zealand versus South Africa game was going to be a real thriller. And so it turned out with New Zealand eventually winning with a six off the penultimate delivery of the match. It could have gone either way and in some ways (such as the weather) New Zealand got the rub of the green. But both teams got their chances in what was a hugely exciting game. I walked Mix after the game had ended (missed out on breakfast) and came to sort out some of the presbytery bits and pieces which had piled up since yesterday. It was a good morning because I got people in when I ‘phoned them (which is certainly not always the case). I had a couple of rolls at lunchtime, sent out a reminder to all ministers about the details of the Moderator’s Visit (and about long service certificates which are to be presented), got things ready for the Business Committee and printed out the documents I require. As there was a bit of time left over, I started getting some of my own bits and pieces sorted out. I hadn’t imagined that I would get quite so busy. However, I put things to one side and took Mix for his afternoon walk before coming home and enjoying a shower before going up to Duns for the meeting. It was a busy meeting, a full house for, I’m told, the first time for a while, and as well as all of the ordinary business we wrestled with the important issues of data protection, the future shape of our presbytery, and the forthcoming Moderator’s visit. We ended almost exactly at nine and I went off for a sausage supper to celebrate! Back home I watched the news and then was glad to get to bed. Normally I write the minutes before bed but tonight I had a head-ache (it wasn’t brought on by the meeting) and was glad to get my head down. It was more likely caused by lack of sleep through watching cricket!